Please add $10.00 for shipping, handling, & insurance. The image size is 19" x 13 1/2". Comes with certificate of authenticity. "According to the Word of God, Jesus was born into the Jewish race. Jesus Christ is now the Risen Lord. We can have no concept of how He actually looks; therefore, I have not clearly indicated His features in Coat of Many Colors, Lord of All. Because He is Lord, He represents all the people of the world. On His coat are flags of the nations and fabrics of the cultures of the world. All the colors of the coat represent the sin that He took on Himself on our behalf. The white robe under the coat represents His pureness, His being totally without sin. 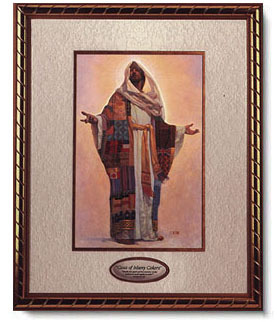 The golden sash is referred to in Scripture as being worn by royalty. He is truly Lord of All!" 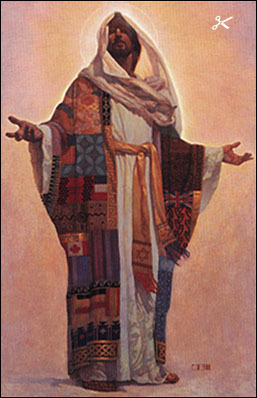 Coat of Many Colors, Lord of All copyright© by Thomas Blackshear II.